Conductor Jacket, Malibu denim, Sportsman Catalog Spring 2017, Made in USA. 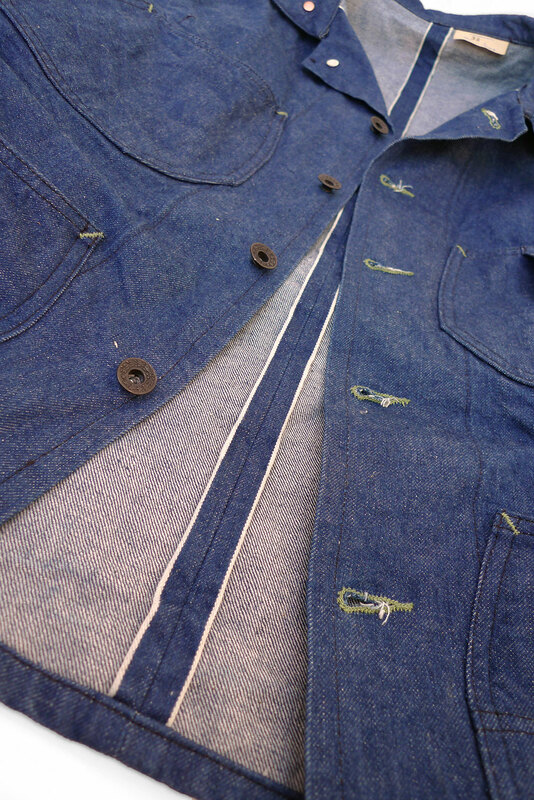 Conductor Jacket, selvedge “Malibu” denim. 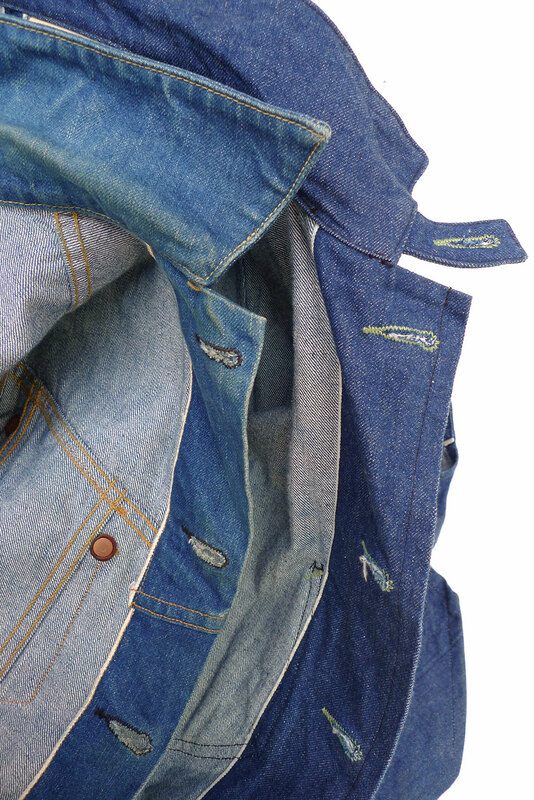 We are adding a new pattern to our ever-growing Mister Freedom® Sportsman catalog this Spring, a fancy Choo-Choo Charlie denim jacket for the caboose-inclined and vintage iron horse connoisseur. 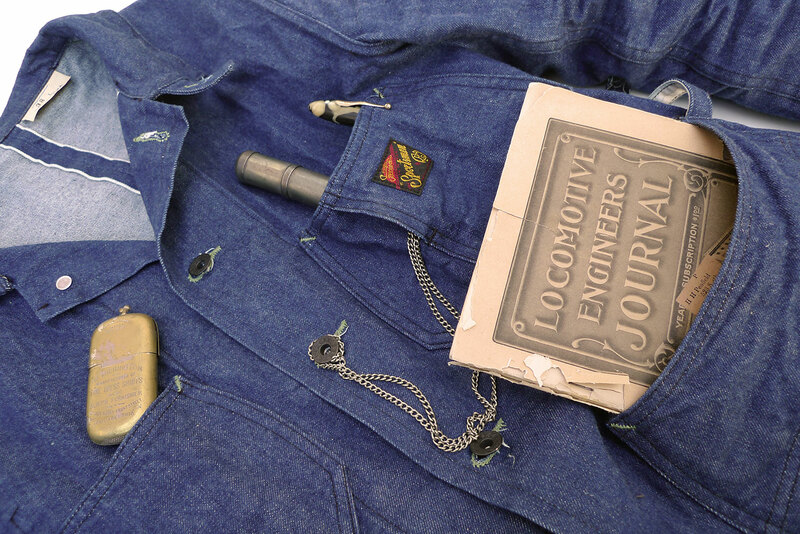 We wanted a work jacket a bit different from other chore coats, engineer jacket, railroad jackets, farmer jackets, …, of the same family. 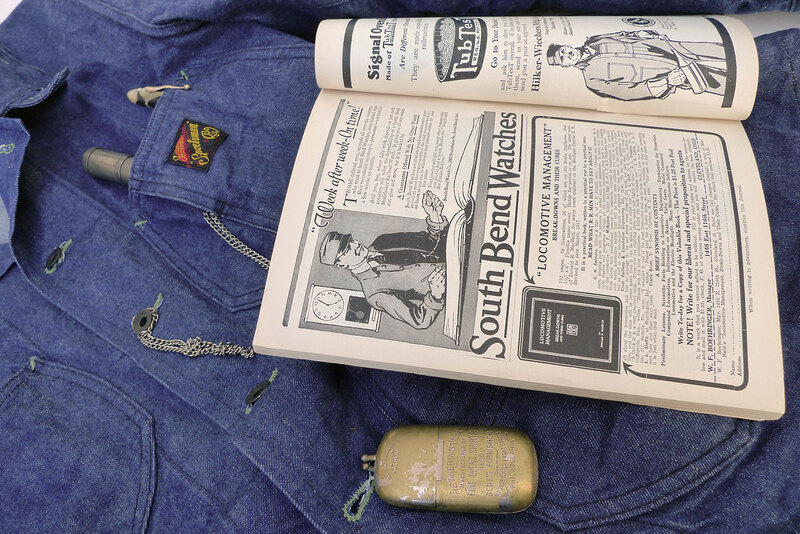 So we grabbed a few pointers from our 1920’s-inspired Loco Jacket (“Viva La Revolución”, Spring 2013), and built one up from scratch, with all original pocket designs and details. 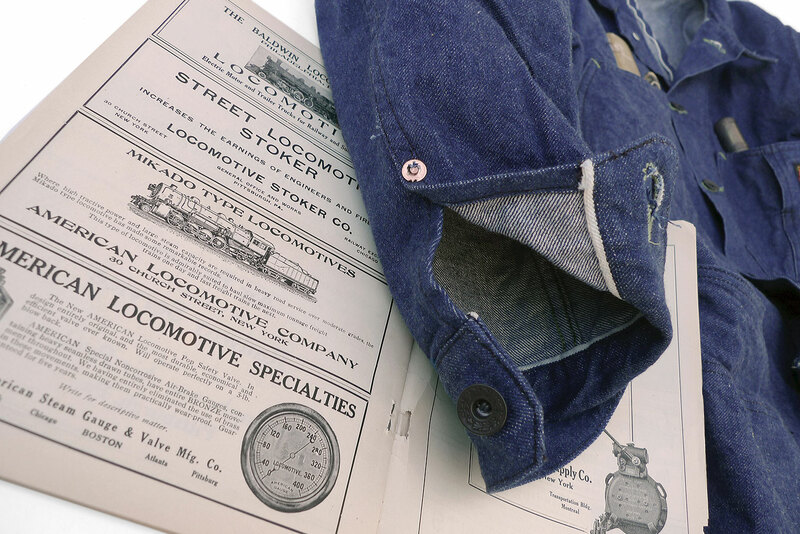 Adding elegant tailoring touches to vintage workwear functional ruggedness, we cooked-up a garment that addresses both the sturdy trainman and the gentleman passenger. Our Conductor Jacket makes it easy to switch from shoveling coal to sipping a libation at the plush red velvet wagon-bar. 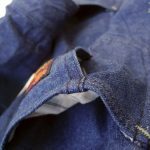 The fabric we opted for is a MF® favorite, the light-color indigo “Malibu Denim”, milled in Japan, introduced a few years ago. It is quite tricky for a dye-house to control a lighter shade of indigo (darker shades are easier to keep consistent, as you can always do another dip…), so we are very happy that this new 2017 batch is as beautiful and unique as its 2015 and 2016 predecessors. 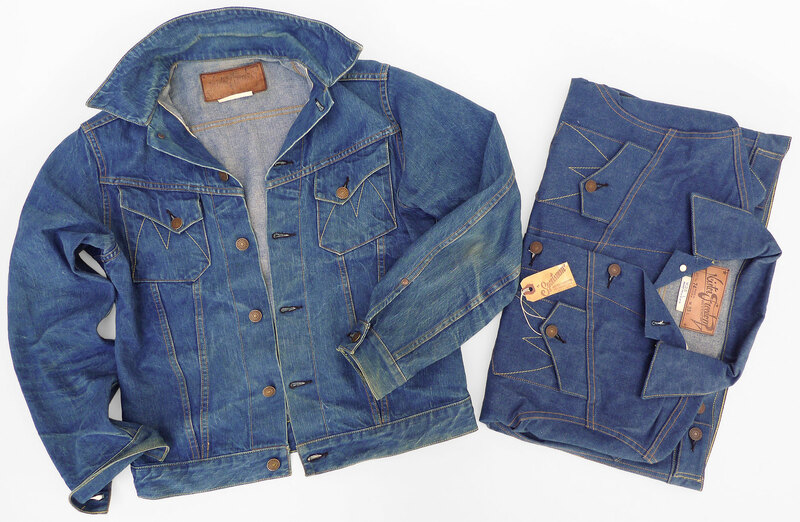 Worn 2016 Cowboy Jacket & rinsed 2017 Conductor, same Malibu denim. 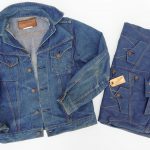 MF® Cowboy Jacket (Malibu denim Spring 2016), worn 1 year. The Conductor Jacket is designed by Mister Freedom® and manufactured in California in collaboration with Sugar Cane Co. 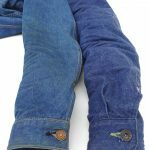 Original mfsc “Malibu Sea” denim, 13 Oz. 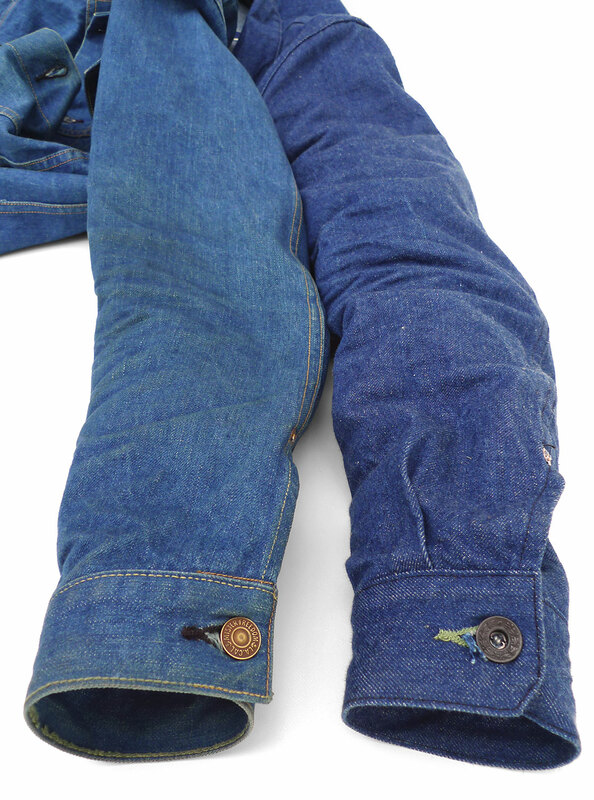 indigo-dyed denim twill, solid white selvedge. Milled in Japan. 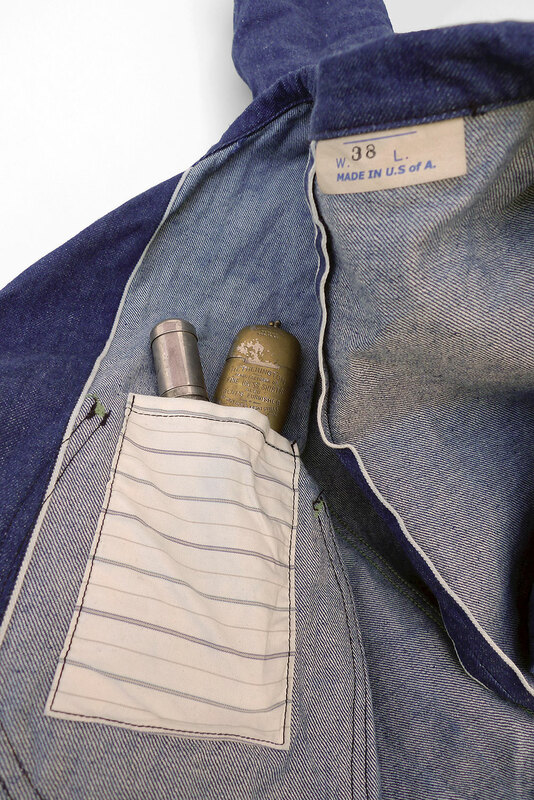 * An all original mfsc pattern inspired by early American workwear and European tailoring, vintage 1920’s-30’s chore coats and denim engineer jackets. * Four original MF® pocket-shape designs. * Elegant front panel cut-away. * Watch compartment on left chest pocket. 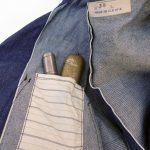 * Pockets lined/half-lined with NOS woven stripe cotton poplin. * Black oxidized donut wreath buttons. * Collar chin strap with contrast copper donut button. 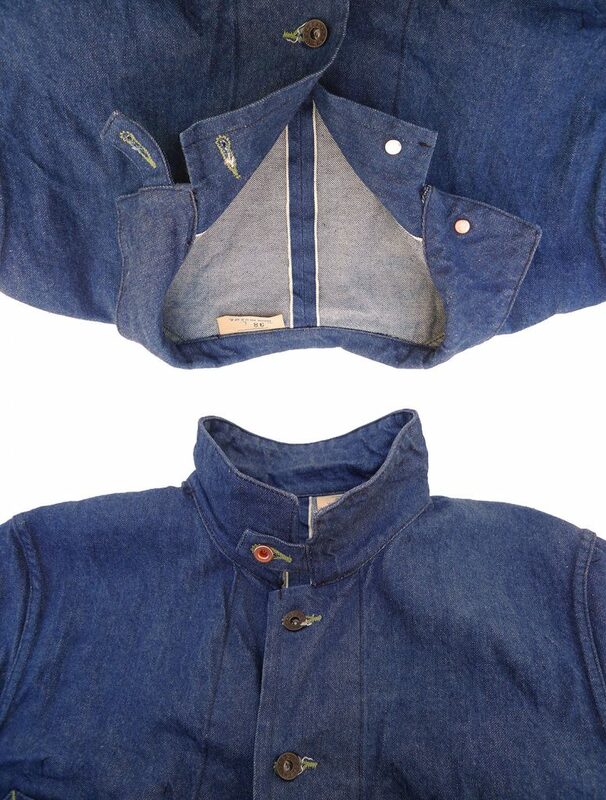 * Split back panel, displaying selvedge ID. 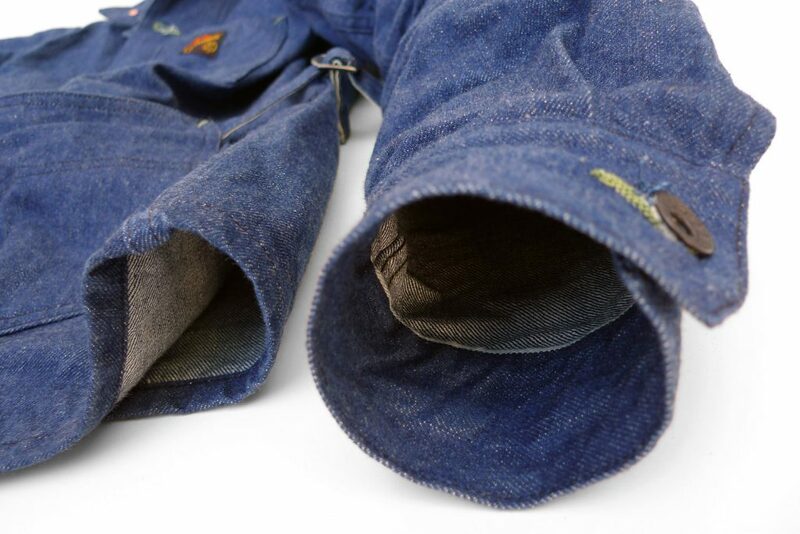 * Selvedge front panel facing, cuffs and watch pocket opening slit. 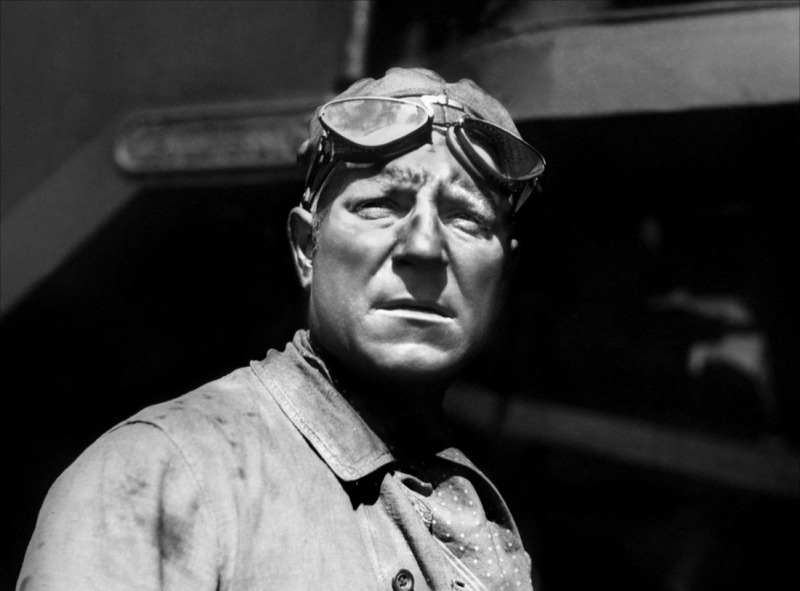 * Side cinch straps, French NOS metal buckles. 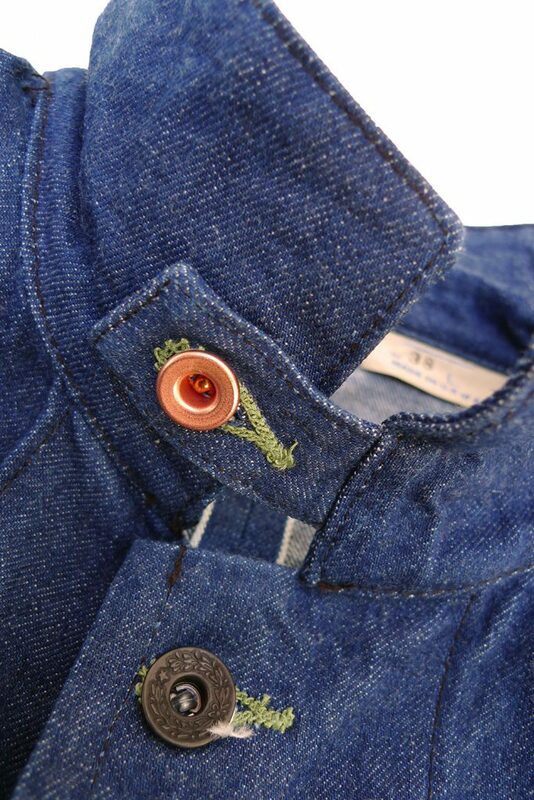 * Contrasting green chainstitch, bar-tacks and button holes. 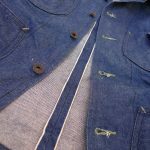 The Conductor Jacket comes UN-WASHED (=raw) and is cut so that the measurements match the labeling after an initial cold soak/line dry. 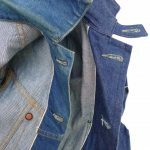 When following this routine, the denim garment will dry quite stiff, due to the re-activated fabric starch contained in the cotton yarns. 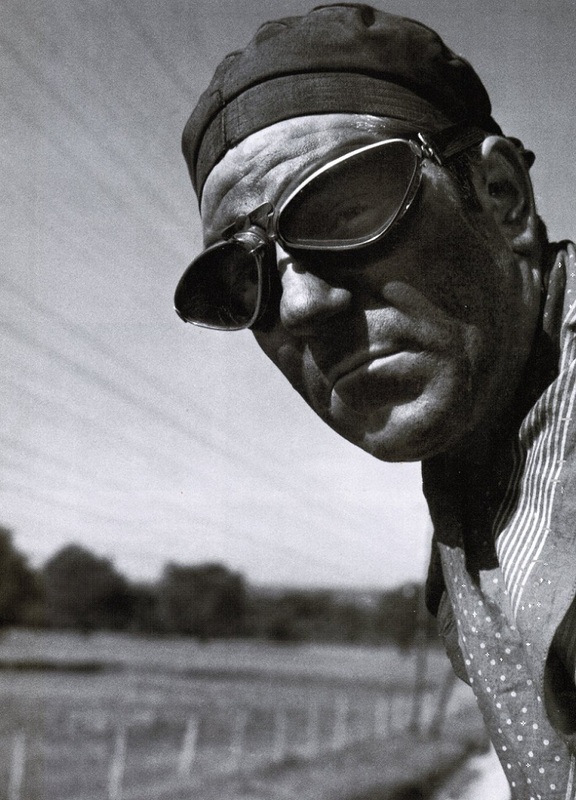 This is normal and will subside with normal wear. I opted for a size 38 (Medium), for a relaxed fit. I could fit a size 36 but preferred having the option to layer in colder weather. 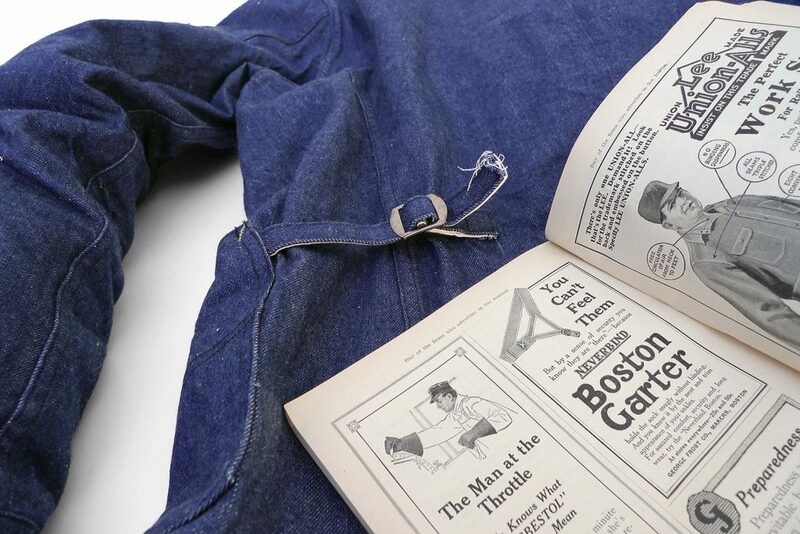 We recommend turning the jacket inside out to avoid marbling on the indigo side. 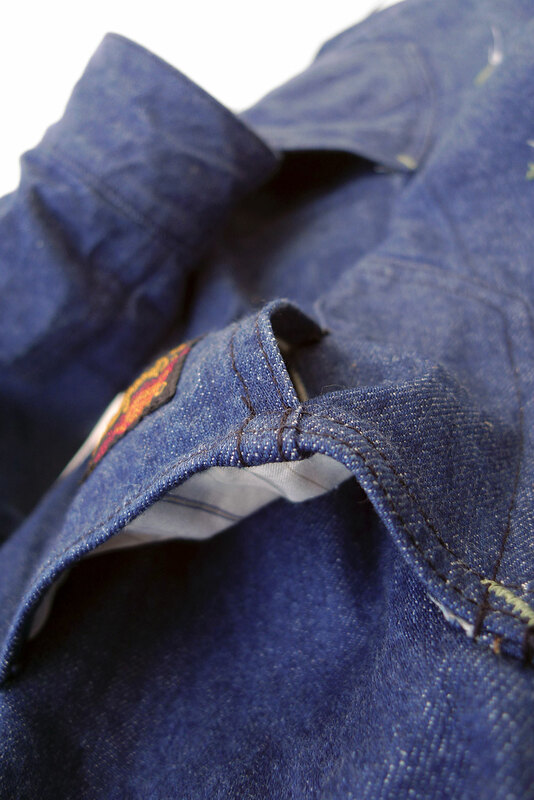 Hand washing can be a good option for those concerned with specific wear patterns and high-contrast colors fades. Otherwise, machine wash inside out with cold water, gentle cycle, eco-friendly mild detergent and line dry. Available from our Los Angeles ol’ pile o’ rags, from www.misterfreedom.com, and fine retailers around the World. 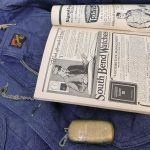 1 comment to Conductor Jacket, Malibu denim, Sportsman Catalog Spring 2017, Made in USA.